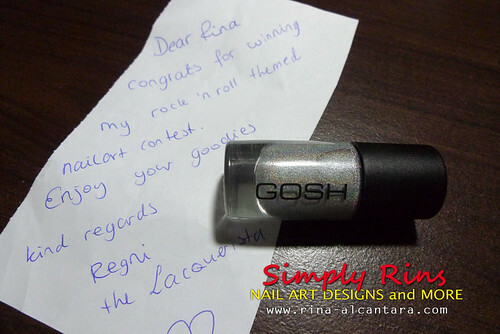 I've entered a few nail art contests last year and luckily, I won in 2 challenges that I entered. But unfortunately, it takes a very (as in) long time for the prizes to reach the Philippines via air mail. I guess it's just really hard to send something to our part of the world. Anyway, I wanted to wait for both prizes to arrive before I post this. After almost 2 months, I finally have them! Crawling Spider Nail Art by Simply Rins! 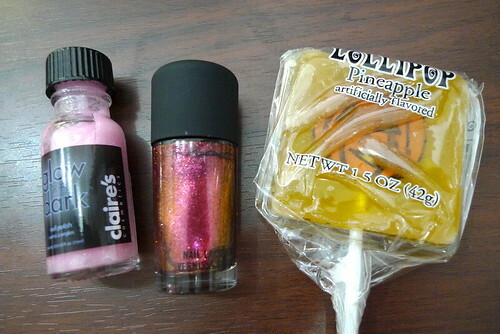 Mac Bad Fairy, Claire's Glow in the Dark and a pineapple flavored lollipop! I'm still waiting for the right occasion to wear my Bad Fairy. I still haven't tried wearing the glow in the dark polish but I bet I'll have fun with that one during a movie trip. :) Thanks Freshie for the wonderful prizes! She was so sweet to track the package she sent by keeping in touch with me. 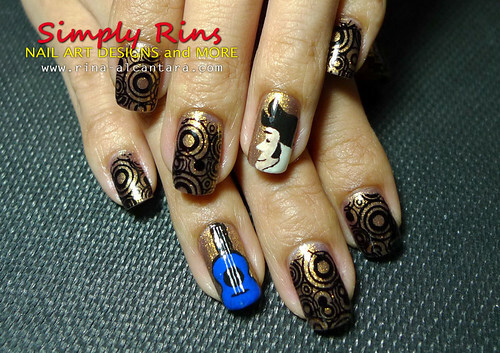 Elvis Nail Art by Simply Rins! Gosh Holographic and a note from the host! Thanks Regni for this cool prize and the handwritten note! I'd also like to thank all my friends and followers who supported me in all the nail art contests that I joined. I truly treasure the loot I got as I couldn't find any of those locally. I apologize to both Freshie and Regni for not being able to post about this sooner. Really? 2 months? I won a giveaway a month ago too and I haven't received it yet. If you had it after 2 months that means I don't have to worry about it since it takes THAT long before I can receive it. Congrats on your winnings! I can't believe it took that long!!! I also can't wait to see that Gosh holographic polish! Hi, Camille! I guess it has something to do with geography or probably the Philippine postal system is really bad? But yes, I'm sure your loot will arrive sooner or later. Congrats! Thanks LadyLuck27! I'll surely enjoy wearing those polishes soon! Congratulations on your wins! You got some good prizes. I love your original nail art! Me encantan tus diseños...!